Well, another 2013 Quad Rock is in the books...and somehow, this one even surpassed the fantastic inaugural year. Last year's run was in unusually cool and foggy conditions, more reminiscent of the rainforest of the Pacific Northwest, plus a dusting of snow up high. This year's event (and, more seriously, the homes and lives of the families, flora, and fauna local to Lory State Park) were threatened by the 1000+ acre Galena Fire in late March, which also affected the ability to train on the course throughout most of April, and led to a slight (but in some ways improved) course re-route. Fortunately, everything was under control, and several rounds and several feet of snow still didn't keep us out. In fact, Spring showed up just in time, the snow melted, and the terrain was greener than most of us (certainly in my household) have ever seen it. So it was off to the races. In any case, like anyone, there's a level of personal effort and satisfaction that comes from the course and distance itself, and trying to put out an effort that matches your training and the best of your ability. I also knew this was a competitive group of guys and gals, and that there would likely be some folks right around my time as well -- some new faces of some experienced friends that I think of as fantastic runners, and some returning guys that no doubt would play their experience from last year as well to an advantage. I had a fun time running last year, in what was for me a hard effort to try to get in the top 10, but looking at this year's field, I figured that was out the window. So I thought more about a time goal, and let placement fall as it may. And then, after a tough Spring for training (weather and general life circumstances), and slogging over the course multiple times in generally 5+ hours when I could, I didn't even know how the heck I did that last year. Some additional pressure was on when Pete obliged in assigning race bib numbers by previous year's finish, so there I was with a ridiculous single-digit bib number/target. Before the race even began, though, I began to remember the biggest part: everyone else. Lots of friends on the trail. Some of them having a great day and running ahead, some of them pushing their limits and running behind. And many -- many! -- of them taking a full day out to volunteer, all on a familiar "home turf" that we love. And while I, too, was excited to see some top-notch competition here, including a few Olympic-qualifiers and other outstanding resumes, to compete against our hometown defending champion, I am unabashedly even more of a fan of seeing how local trailrunning friends do, knowing that some of them are doing their longest or hardest run ever, perhaps their first 25 or 50 miler; and with some of them tacking on additional challenges like breastfeeding(!) during the race. And there's room for all of us, which is what makes the race so great. One more thing before the race: Besides a great, communal pasta dinner at Alex's on Thursday night, I also ate a whole damn bag of Marshmallow Avalanche cereal. I like cereal occasionally, but I don't think I'll be hungry for sweetened cereal again anytime soon. I've had it before a few races, and generally prefer rice-based Asian food to pasta for a variety of reasons: generally more vegetables and less sugar, but also the spices are more conducive to promoting drinking lots of water. It occurred to me to mention this specifically, because it's a limited, local chain that also happens to be very close to Runner's Roost (packet pickup and great running store). Bann Thai is another good, close option. 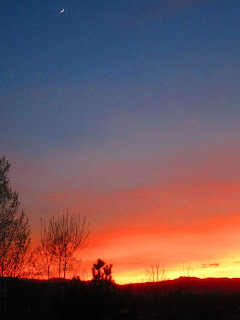 PG and I woke up almost before we went to sleep, it seems, and headed up to Lory State Park, eventually merging with the string of headlights making their way around Horsetooth Reservoir and into Lory. Things were still a bit busy as people scrambled to get bibs and drop bags ready, but as usual it all worked out, and there was enough time to mingle around and find friends as well. Nick informed us of the final course layout, and bid us off. Although still awfully early, the fact that we started at 5:30 gave us enough daylight (vs. the previous year) for not needing headlamps at all. Sensible. The temperature was cool when standing still, but just about perfect for running. Even with likely cooler temperatures in the shade up higher, there still wasn't a need for gloves or a hat in the morning. The shoelaces were on Saucony Peregrine 3's -- I decided a week before the race that it would be a good idea to get new shoes, as my old one's were all ripped up on the sides. Compared to Cascadias (that I wore last year), I enjoy the Peregrine's being lighter, grippier, and with nary a shoelace untied. I also think they're pretty cool looking. Anyway, call me a bit of a roadie, but I enjoyed the early road miles (reconfigured due to fire damage on the bridges on the parallel trails), as there was much less congestion and more room to both run and socialize. I know every race likes to brag about being 99.9% (or more) singletrack, but the room to maneuver was nice. As it turns out, I also found this more conducive to spectating at the end, especially by bike, while the car traffic didn't seem overly obnoxious. Finally, the while the Valley Trails that we skipped are nice in perfect conditions, they're the most prone to sticky mud if we do actually get rain, and average weekend afternoons seem to have a higher horse presence (or evidence thereof). So I was fine with the reroute. Phenomenal. Even on the way back, the feast of colours was a pleasant distraction in the last painful miles. I tried to stay restrained on the open road, but probably ran a little faster without the congestion of last year. And I think we were all eager to start climbing on singletrack, up the rerouted, more switchbacked Sawmill trail. By being more mellow and less rocky, Sawmill is runnable if you keep spinning in a low gear. Things stayed mostly steady here, I might have passed a few, and we had 3 downed trees on the trail, but soon enough we were rolling on Stout. Knowing that a solid Towers climb is coming, the Stout downhills are a good chance to stretch your legs, smartly -- just remember to stay smooth and not beat up your quads or feet too much yet. I think I passed PG taking an initial break somewhere around here, expecting to see him later. Similar to last year, I hiked the shorter pitches of Towers, and focused on being able to run the crests onto the flat and downhill reprieves. My hiking worked well enough to keep up with runners nearby, and use slightly different muscles, so most of this stretch was about staying in the same relative position. The only other thing worth noting was trying to eat EFS gel on the uphills, though I wasn't particularly hungry, and stay on top of the calorie game. Knowing that I probably won't need or eat much on the Spring Creek downhill (especially the fast early part), I then skipped the famous Towers Aid station and started cruising downhill. I think I was right at an hour at this point. Now it was time to cruise downhill, with the rocks being wet but not terrible. I had enough room in front and behind to maneuver without pressure, and mostly kept the distance ahead of me constant. I knew I would hate this uphill later but enjoyed it while I could. Soon enough, we were out of the technical sections, and had the last gradual uphill followed by the easy downhill. I finished the EFS gel, which works out conveniently well as 400 kcal for the first 90 minutes. I knew we were close so I pushed it, catching up to a few people, including eventual women's winner Kerrie Bruxvoort, rolling into the aid station with her. In my races, being around the fast, talented, and smart top females is usually a good sign. I think we were around 94-95 minutes when leaving the aid station here, which I think was about 5 minutes faster than last year. I was happy to see familiar faces down there, with Jaime coming up to volunteer, while he and Erskine helped get my water filled and NMP refilled my gel. They teased me about my "empty drop bag" I left there -- indeed, I called that my "anti-drop bag," so that if I had a shirt or gloves or something that I wanted to ditch, I could easily put it in in there. But I didn't need anything from the anti-drop bag. I left with a small group, including Kerrie, pushing the more gradual grades with renewed vigour, but again went back to a short power hike on the slightly steeper left turn, before running it up to the Rock trail. This is about the most popular section of the park, but hiker traffic was friendly and light. Despite the Rock trail being steeper, I ran all of this, and was pleasantly surprised to see the downed tree that had been there for months was finally deposed. Somewhere in front of me then gave an encouraging greeting, but I couldn't immediately make him out from behind. Indeed, it was Bryan Williams, and I had an immediate flashback to 2 weeks prior when we met for a training run on these same trails. He was running strong and it was great to have his company and cheer on the trail. We benefited from the mutual energy, and it turns out we'd continue to do so hours into the race. I also enjoyed similar trail time with local Lee Roberson, himself running a great race. I think we hit Westridge right at 2 hours, and mostly Lee and I (and another fellow) ended up making decent work out of that in 17-18 minutes. I was feeling better on the climbs by now but being a bit conservative on the energy for the downhills -- not that I wasn't chomping at the bit for the Mill Creek downhill. Again, it was too early to need much more, and I didn't want too much jiggling around for the upcoming, steep downhill. I might have grabbed a little bit of soda here, which ended up being a theme that worked the rest of the day. I was looking forward to the Mill Creek downhill, and enjoyed it pretty much to myself, using the occasional uphills for drinking and eating as necessary. Somewhere in here, I think, I saw Karl Meltzer with another runner (presumably his wife) pulled off on the side of the trail, completely stopped and stretching out some sort of injury. I was confused both at the idea of seeing Karl there, but also not expecting/having no idea of a female runner being way out ahead, but then completely stopped. I slowed and asked if they needed anything. They didn't, and Karl said they were working on an injury, but Karl graciously wished me a good race. By Arthur's, I was still feeling good and stocked up on EFS and water at the aid station, also slamming a few small cups of soda. During the day, various combinations of Ginger Ale, Mt. Dew, and/or Coke sounded good. More climbing again, with Bryan and Lee nearby. I met Steven from Utah at some point, too, and saw him a few more times. Mostly quiet running and steady climbing, all of it with a running motion, and it felt especially good in the shade. Finally, our "Steep, Rocky Switchbacks" ended (as per the sign), and the tight Timber right-turn was well marked for our deceptively long and exposed descent. As expected, I enjoyed seeing the leaders here, mostly recognizing and happy to see Josh, Ryan, and Paul T. doing well, roughly 15 minutes from the turnaround, which put them half an hour ahead and on-pace for beating me by an hour. All this meant is that I was running where I wanted to be; they were running a smart race with a few guys together; and nobody was going to run some crazy 7-hour race or other nonsense people gossip about. There were more sizeable gaps after the first 3 or 4, and I did continue to count heads, and ran out of fingers as expected. But I was pleasantly surprised to only get to 14 or so. Cheering these guys on was a fun distraction, and again it seemed reasonable for both directions of traffic to keep moving on the trail, as I tried to yield to them, which was also reciprocated by other runners. As expected (and advised) for 25-milers, some guys made their moves on the downhill here, and I let them go and cheered them on. For awhile it seemed like 4 hours was close, but wasn't the right number for me to be chasing right now, and I also tend to forget about the extra minute or two of flat running at the bottom to get in and through the turnaround. As I hit the road, I saw Salmberg coming up the trail with what looked like an armload of groceries, as he looked to store his various bottles and food somewhere on his body. Just like last year, Victoria and Marie got me through the turnaround quickly, but all I needed was food and water, no drop bag. I also had a little salt here, in terms of potato chips and some salt tabs, mostly on the theory of "It was hot" and "I'm kind of craving salt right now." I had been thinking about ditching the shirt, but decided to keep it, thinking that a bonk timed with an afternoon hailstorm would be worse. Time for lap 2, which I left outbound at just under 4:09. Umm, pretty much the same, just in reverse, and slower. Somewhere around here, I found Sam, who had a tough, tight hamstring issue that affected his climbing. And he's about the best climber out there, so it was tough. He said the downhills helped and hoped it would stretch out. I also don't think I've ever seen Sam in a bad mood, and he makes me laugh, so it was good hanging with him. We hit Westridge together and grabbed some water, but I ended up pulling away. I ran some more with Steven, but lost him with a quick stop at Arthur's. And now for the dreaded Mill Creek climb. Nobody was around, front or back, so I didn't have good pacesetting. Time to just grind it out. I hit the first steeper section, and decided to keep running it. OK. Then the second, I was surviving. Eventually I saw a white shirt -- Troy -- and I saw that I was gaining a tiny bit. So I decided to run the whole thing, even with short, choppy steps that be outhiked, figuring the shift to walking too much at that point would leave me stiffer and disinterested in running. Also, it was a distracting mind game to focus on running and not thinking about time or other things. Lastly, I hoped/thought that occasional backward glances at me, always running, might have a psychological impact. Finally, we reached the last turn with sunlight breaking through the trees and the familiar wooden steps (the main discernible difference between that final turn and previous false summits), and I shouted to Troy that we made it! Now I was happy to be at Towers Aid again for a re-stock. And the guys informed us that there were some "tired boys" up ahead. Even better! We left Towers together for Westridge and finally had a chance to meet, Troy was a bit worked from the previous weekend and let me go, but obviously continued to catch more guys. I was ecstatic to be feeling good and having the chance to hunt down race positions now. Somewhere on Westridge, I saw/met Trent Briney, who was hurting badly. To his total credit, he had been feeling terrible for awhile, was running by himself far below his capacity, and could have easily ditched anywhere and would have had a great 25M time instead -- but he pushed on. I wished him luck, and instead of sinking into his own race, he told me that the next 2 guys shouldn't be too far ahead. I really enjoy the sportsmanship and fun of cheering each other on like that. I was buoyed by that even more, and kept expecting to see guys, but it took me all the way down to Southridge to get a first glimpse: Nick Davis and Bryan Williams, both solid runners and friends who I wouldn't be upset finishing behind. I was able to catch up and come into the aid station together. By my count, we were in the mix for top 10, so we had just over 10 miles of fun racing together. I whooped it up and said, "C'mon guys, it's time to race!" Nick seemed a little worn, I got out quickly and headed up. Bryan came out and seemed stiff. I planned all along to be able to run this part of the trail, knowing that I should be able to run it. That plan worked for about the first half. Bryan and I still cheered each other on from voice distance. I had to slow to a hike to keep my heart rate down, then I'd look back, and he was running. Psychological advantage: Bryan! He was looking good and I let him pass. While I was recovering, he kept gaining, but it still felt less stressful than being ahead. I just needed to keep him in sight, and then it would come to the downhill. I rallied a little and he came in about a minute ahead, I cheered him on for finishing the last climb. We were clear ahead and behind, so it was just us 2, able to leave together. Except I forgot about the couple kick-to-the-groin uphill sections on Stout. Embarrassingly, it was quicker for me to hike. Running uphill drained my legs and made my heart want to explode, I'm sure I was getting dehydrated. But I stayed far enough ahead and finally the intersection came into view. I saw Bryan in a long view, and in my paranoid nightmares everyone is able to run at 200-meter speed while I can't keep up, but of course the reality is that he was moving about the same as me. I made it up to Arthur's, happy to see Nora in her tutu and Mindy (and a roving Nick Clark) at the aid station, and took a few quick swigs of soda. I was happy to have the road to myself. If you're feeling good, it's sort of a final, Tour de France stage where you can gradually and victoriously (in your own little way) roll into the finish. There should be a gentlemanly/gentlewomanly agreement of no passing here, because having to actually race on that part of the road -- the only flat spot of the race -- would be terrible. (Although Alex May did exactly that, to his advantage, with a gamely sprint finish). I was alone, and then just minutes before I finished, rather than cheering crowds and confetti, the skies opened up, thunder cracked, and I was unceremoniously pelted with graupel. It did feel refreshing, however. Everyone else was undercover in some sort of shelter, so I shouted just so Somebody With Authority could note my time and I could gratefully stop running. I remember wishing I had a computer or pen and paper, so I could write myself a note about how there wasn't any way I could have run a minute faster. Now as I finish typing everything up, I think about where I could "easily" gain a minute here, two minutes there. That's stupid. I am very happy to finish where I did. Pretty stout guys ahead and also behind. Anyway, I wasn't yet hungry and I wanted to see some buddies finish, so I took my mt. bike from my car and took a slow spin out to Arthur's, which felt good on the legs. Basically watched and chatted a bit, and then the next storm rolled in, and I was instantly cold and now very hungry. The black bean burgers and tabouli salad were awesome, so I've got to give credit to that as being both delicious and a nice nod to something relatively healthy and maybe environmentally-friendly, which is a second reason (in addition to the foliage) that I mentioned "Greener" in the title. And a final one: I thought the next day about how little (none) litter I saw on the trail. 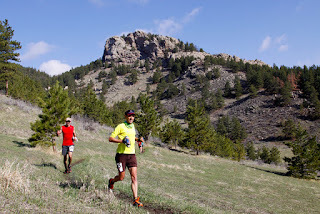 Compare that, sadly, to Leadville or Western States, or most road marathons, which granted, have bigger fields (much bigger, in the case of Leadville), but also have much longer independent trails, with all of Quad Rock being squished into 25 miles. Since these are our hometown trails, I'd be extra-sensitive to seeing trash on the trails, yet I don't recall any. A big part of this, I think, is the deliberate choice of gel flasks instead of packets, so I think there's a lesson for other races (and gel companies) here. But also a deserved tip o' the visor to fellow respectful runners, and Pete and Nick for setting the bar high for trail race organization details. Of course, the "53rd Mile" (or whatever they call it) Pateros Creek beer was awesome as always. An even bigger THANKS to all the wonderful volunteers out there! If I tried to name, say, 20 (and I could) I'd miss the 21st, so I've tried to thank them during the race or afterward. You guys make it awesome. Thanks for reading if you got this far, this was another fun race and a good confidence boost for the year. And so now you roll into Black Hills ... probably a favorite to podium? You might even have the highest VDOT at the start line. Full disclosure: as yet, I've only skimmed it. The "AJW" of Quad Rock! We'll see you in the top 10 for years to come. Great run Mike! Thanks guys. 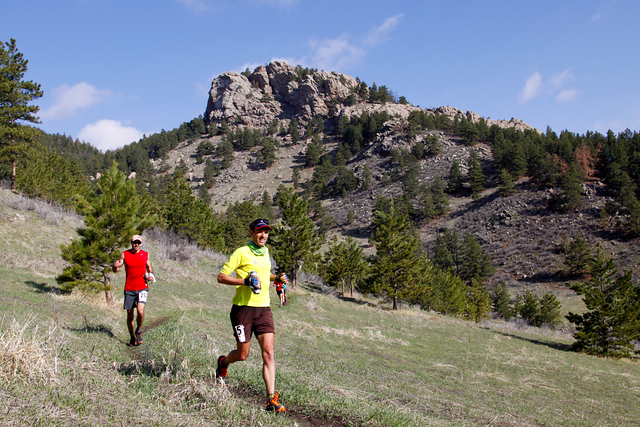 GZ, some fast(er than me) guys at Black Hills, so should be a good time. My limited 100's have gone either way but staying happy and focused seems to be a critical component -- looking forward to seeing another big beautiful chunk of country. I'll be happy to run /with/ some of them. As I told Nick, I'd rather get 5th or 6th (just for example) with some racin' involved than 2nd while running way off by myself. Great race, man. Sounds like it went off really well. It is definitely green up there. Good aesthetically, and for the whole not-burning-the-parks-down thing. Cereal: based on my childhood eating habits, I'm probably owed a lucrative Cap'n Crunch sponsorship. Nice job out there! I will say that you're choice in apparel helped me to pick you out of the crowd quite easily as we were running the early miles along the valley road (and that same shirt is one of my favorites for similar weather conditions). The Quad Rock trails are quite similar to what you'll find in the Black Hills, although the climbs at QR are a bit longer than any single climb on the BH course (but, of course, what BH lacks in long climbs, it makes up for in quantity). Given that, I think you'll do quite well next month. We've had a good number of "fast guys" show up and subsequently DNF. Hell, maybe I'll even given you a single digit bib number just because...seemed to work for you at QR! VERY impressive that you bumped yourself up 5 positions after the turnaround. You were looking strong and relaxed climbing up Timber as I was coming down. Great day! The energy you brought into the mile 40(ish) Aid Station was simply awesome! But not as awesome as your anti drop bag. Congrats on a way impressive race! It has very superior blog! I always accurately came here from http://klebebh.ch that thoughts to be outstanding tenacious confront raising video in the humans and it's very effective. Your idea is outstanding; the issue is something that not enough people are speaking intellig…Rückenfreie bh Der Bye Bra klebe bh ist eine einfache Lösung, um die weibliche Brust optimal zu präsentieren - schnell, effektiv und dies ganz ohne BH oder gar Operation! Naše neviditelná podprsenka s okamžitým účinkem je “made in Holland” a vyrobena největším výrobcem náplastí – 3M. Distancujeme se od čínské napodobeniny produktu, která může mít negativní vliv na pokožku. Neviditelnapodprsenka.cz není jen lepící páska, ale průhledná, voděodolná, hypoalergenní lepící páska, kterou jste u jiných výrobců ještě neviděli. Proto máme právo se nazývat experty v neviditelných podprsenkách – průhledných, nalepovacích páskách. Pokud máte nějaké dotazy týkající se materiálu, kvality nebo potřebujete pokyny k použití, které naleznete v tomto Bye Bra videu, neváhejte nám zavolat nebo poslat email přes naš kontaktní formulář. Really this is first class site. Thanks you for this post. strapless bh Een strapless moet natuurlijk goed zitten. Een strapless werkt alleen als het een onzichtbare bh, een zefklevende bh en een transparante bh in één is. strapless bh , Een strapless bh dient een hele avond mee te gaan en is het liefst nog hergebruikbaar ook. Gelukkig zijn deze strapless plak bh's te vinden op plakbh.nl waar een veelvoud aan plak bh's worden aangebode. A strapless bra should fit perfectly. A strapless bra only works if it is an invisible bra, an adhesive bra and a transparant bra all together. A strapless bra should stay on all night and if it is re-usable, it's even better. Happily, the strapless bra's of plakbh.nl are very good and they have a big variety available.